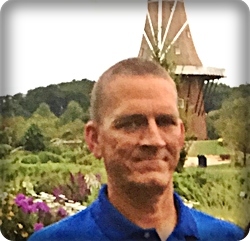 Kirk L. Mann, age 53, of Caledonia, entered his heavenly home on Monday, June 25, 2018, surrounded by his family. To all who knew him, Kirk, Pops, Gumby, Special K, Mr. Mann, was a man of many hats and many more nicknames. He opened his arms and home to many over the years with an easy smile and lots of laughter – many even received a silly, lifelong nickname of their own. He was preceded in death by his paternal grandfather, Harold Lindsey Mann, Sr.; his maternal grandmother, Moleta B. Hodges; and his uncle, David Mann. Kirk will be lovingly remembered by his wife, Jackie; his children, Grayson, Caden, and Annalynn; his parents, Harold and Dot Mann; his siblings, Dortch (Sara Beth George) Mann, Deb (Marshall) Moss, Leta (John) Brown, Margo (Mark) Harris; his grandmother, Margie Mann; parents-in-law, RTLTC James and Kaew Carman; brother-in-law and sisters-in-law, Sean (Tifney) Carman, Nikki (Gary) McClanahan, Monica Carman; numerous nieces, nephews; several great nieces and nephews. The family will greet visitors at Stroo Funeral Home. The funeral service will be held , at Cornerstone Church, 1675 84th St. SE, with Pastor Alex Fernandez and Pastor Kyle Kotrch officiating. Interment will be in Dutton Cemetery. Contributions in memory of Kirk may be made to the Spectrum Health Lemmen-Holton Cancer Pavilion, MC004. God bless you and your family. I am very sorry for your loss. My prayers are with you. God Bless and prayers sent to his family. Cheers to a remarkable man who was taken too soon like so many great people before him. As one who has experienced grief intimately, I always say it never gets better it's just about living your new normal and keeping him in your heart. May his legacy live on. To the entire Mann family; Kirk was loved and will be missed by so many; especially the 1983 Jo Byrns High School classmates. Sending love and prayers to you all during this time of loss.